SIGN UP FOR AN ACCOUNT You are only 3 steps away from enjoying the newest online casino in the world. 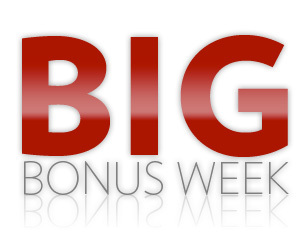 Over the next week we are kicking off the year right with some huge bonuses. Throughout the week our members will be greeted with bonuses that everyone can enjoy. From Saturdays 166% up to $/£/€166.00 to Tuesday’s 120% uo to a massive $/£/€240.00 bonus! Make sure that you login to take advantage of these great offers! This Saturday 00:00GMT until 23:59GMT, on your first deposit of $/£/€10 or more members are eligible for our exciting Your Choice bonus. Awesome Sunday! On Sunday from 00:00GMT until 23:59 GMT, all members on their first deposit of just $/£/€30 or more will receive 100% bonus up to $/£/€100.00. Value Bonus! From 00:00GMT until 23:59 GMT, all members on their deposit of $/£/€10 or more will receive a 115% bonus up to 115.00 bonus. BIG BONUS TUESDAY! From 00:00GMT until 23:59 GMT, all members are invited to receive a 120% bonus up to $/£/€ 240 on your first deposit of $/£/€ 30 or more. Super 2X Thursday! From 00:00GMT until 23:59 GMT, all members are invited to receive a 125% bonus up to 125.00 on your first deposit of $/£/€ 30 or more. Claim it twice for 250.00! Voted our most popular promotion by our members, The Hot Seat Promotion is a guaranteed win. For each qualifying gaming day that you play you will be awarded with one Hot Seat Point. The more days that you play, the hotter your seat gets and the more cash you win. Play 28 days or more during the promotional period you WILL win $/€/£500.00! ©2013 - 2019 FlyCasino ® All Rights Reserved. www.flycasino.com is the website of Backweb services limited.